Now that we've "sprung forward" with Daylight Saving Time, it must mean that spring is here. Actually, the first day of the spring season is the day of the year when the Sun crosses the celestial equator moving northward, which occurs on March 20th this year. This day is known as the Vernal Equinox. In any event, the plants are starting to waken from their winter dormancy (especially the weeds at my house! ), which is always a challenge for a garden railroad layout. Read on to find out the latest news from the Club and some of the activities we've lined up for the rest of the year. As I open this column, I am out of the state and watching whales in the great state of Hawaii. My wife and I come here every year during February to take a “Work-cation”. We relax and then plow into our volunteering with the Whale Trust. Each year they have a conference, open and free to the public, that brings in researchers from all over the world. They educate the public on the North Pacific Humpback whale and all monies made from the conference are sent to researchers to fund them for another year. The count is not yet in for this year, but in 2015 we raised over $167,000. We were not able to attend in 2017, but the Whale Trust raised over $500,000. But, you all have been left in very capable hands with Pete, Cindy, Dave Valdez, Jerry, and Lane. 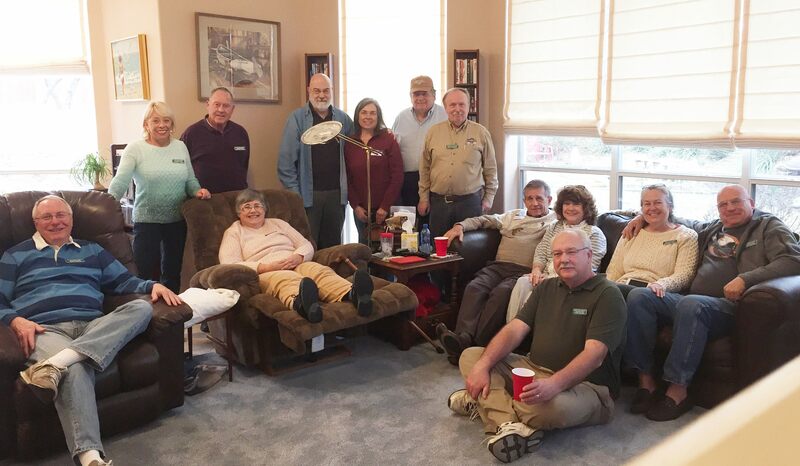 Steve may not have been available to attend, as he is also out of the state and hard at work in Kansas; I understand you had a great meeting at the home of Ron and Peggy Trees in February. About 15 or so came and braved the cooler air and the rain. Thanks Ron and Peggy. I will return shortly, but I am here to tell you that when you are involved with trains, they jump out at you everywhere. Here on Maui there is a tourist train called the “Sugar Cane” train. It is remnants of the train that hauled sugar cane down to the Maui Sugar Cane Mill. Three Porter steam locomotives (two are operational) and both open air and covered passenger cars when shut down in October 2014. Owner died, and family did not want to continue its operation. Two individuals have purchased the equipment and right of ways and have reopened this train in October of 2016. It has about 7 miles of track and very old paddle board RR crossing signs. They currently run on Sundays and special occasions and Christmas, New Year’s and state holidays. They are trying to keep the FRA out of its operations and also still trying to meet the requirements of the State of Hawaii. However, they have run into right of way issues and only run on a limited basis as they have lost about 4 miles of track because private driveways and two public streets have paved over the track. Then on one of my whale watch trips I met a young couple who live in the Los Angeles/Long Beach/Laguna Beach area. BIG G scale fan. Unfortunately, they live in a condo. 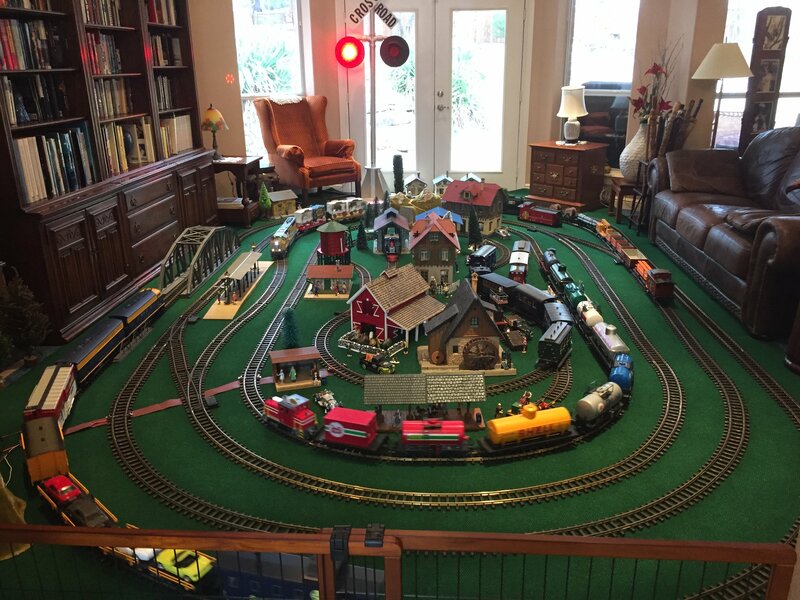 His track, locomotives and cars that he and his dad ran are in storage. The good news is that they have friends in Rockwall that they come to see every 12 to 18 months. He is looking to do what ever we are doing when he and his wife come to Texas on their next trip. The next meeting will be at M’Lou and my home on the 25th of March at 2 PM to 4 PM: 2524 Willowdale Drive, Carrollton, Texas. Just off the 190 George Bush turnpike and Kelly Road. I hope to have a guest speaker that will talk about DCC and how easy it is to install and use. The company is located in Richardson and is called AirWire. More to follow. I will be serving a traditional Irish/Tex-Mex/Texas Ham, rolls and M’Lou’s infamous potato salad. Since St Paddies day is close at hand I am trying to talk her into making it green instead of yellow, but not making much head-way. Oh, not that I do not enjoy a good beer, BUT drinks provided will be Ice Tea (of course unsweetened) with sweetener available; various sodas in that infamous Red Plastic Cup; and ice-cold water. Hors d’oeuvres will be there to tantalize your palette. And of course, the non-traditional veggie platter for those who are still trying to recover their waist lines from the holidays. Reminder: Your 2018 Dues are still only $25.00 for this year AND a Life-Time Membership is still only $250.00. Those Life-Time memberships make a wonderful gift. May your tracks be true; your stay on passing’s be short; do not take any dead-end sidings and keep her between and out of the ditches. I had 12 more new club hats made and sold four at the meeting. So, if you missed getting one, we have 8 more ready for sale at $13.00 each. We will have them at the March meeting at Tom and M’Lou’s home on March 25th. We did have some new members there - Dr. Dave and Gerry Minna. See you Tom and M’Lou’s---I’m sure the food will be magnificent! Q: What manufactures do what different scales in the G scale lineup? Both now and those that are defunct? Accucraft (including subsidiaries AML and AMS) does both 1:20.3 and 1:32. The 20.3 scale is to represent narrow (3 ft.) gauge trains on gauge 1 track and the 32 scale is to represent standard (4’-8.5”) on gauge 1 track. They additionally do 1:19 and 1:13.7 which represent European industrial / narrow gauge trains. Accucraft does live steam locomotives in addition to electric power. Accucraft produces very detailed models in limited runs which are not reproduced. Needless to say they are expensive. Aristocraft (no longer in existence) produced primarily in 1:29. Their equipment represented standard gauge trains from approximately the 1930s to 1970s (steam and diesel). Their equipment had a reasonable amount of detail and was reasonably priced. Some of the later locomotives came DCC ready. Bachmann has started to produce some replacement parts and equipment from the Aristocraft catalog. Aster produced fine scale brass models in the late 1990s for LGB including some live steam. There were some live steam in addition to electric power. Because they produced for LGB, there may have been some tweaking of scale to make them run on the gauge 1 track. Bachmann has two major lines of gauge 1 trains. The first is the “Big Hauler” line which is approximately 1:24 scale. These trains have limited detail and are relatively inexpensive. To my knowledge there is only one locomotive which is a 4-6-0. There are two models of the “Big Hauler,” one of which the “Anniversary” or “Annie” has more detail and is slightly more expensive. The second line Bachmann has is the “Spectrum” line which is 1:20.3. The Spectrum line has done a series of narrow gauge geared locomotives; Shays; Climax; and Heisler. 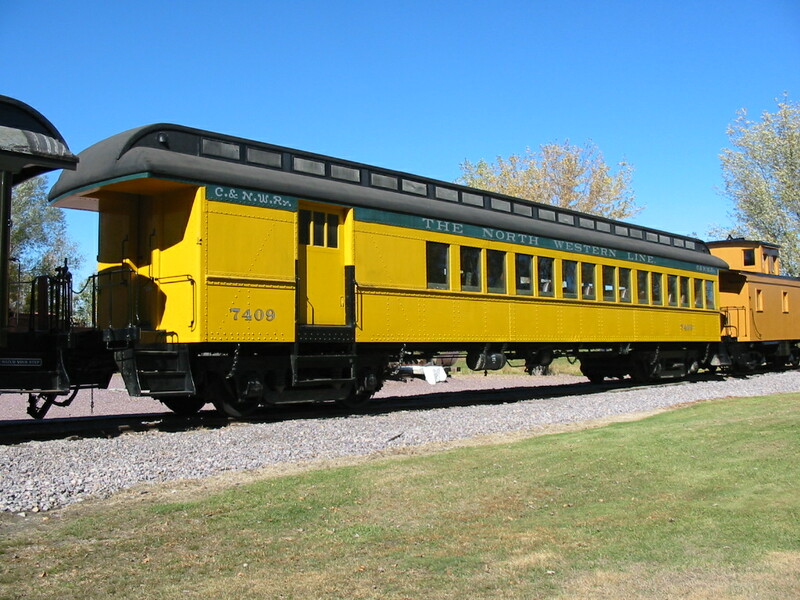 Additionally they have done a K-27 which was a common narrow gauge engine in Colorado and an early center cab diesel. The Spectrum line has a good amount of detail but not as much as Accucraft. The Spectrum line is more expensive than the Big Hauler line but not as expensive as Accucraft. The Spectrum line of locomotives comes DCC ready. Berlyn Locomotive Works built 1:20.3 models of selected Colorado narrow gauge trains. There were very limited numbers of each train built. Their level of detail was equivalent to Accucraft and pricing was equivalent. Delton Locomotive Works was one of the very early manufacturers for large scale. Their equipment was approximately 1:24 scale and represented late 1880s style trains. They made a C-16 (2-8-0) steam engine as well as a railbus. To my eye the C-16 was smaller than the LGB Mogul which would have been an equivalent engine. Delton’s level of detail was adequate and prices were reasonable. When Delton went out of business its tooling was acquired by Aristocraft and in particular the C-16 and railbus continued to be marketed by Aristocraft. Hartland Locomotive Works was another of the early manufacturers. Their scale was approximately 1:24 although they did not really try to model too many prototypes. They are still in business. Their notable products were some interurban and trolleys. A unique factor is that they are still manufactured in the US. 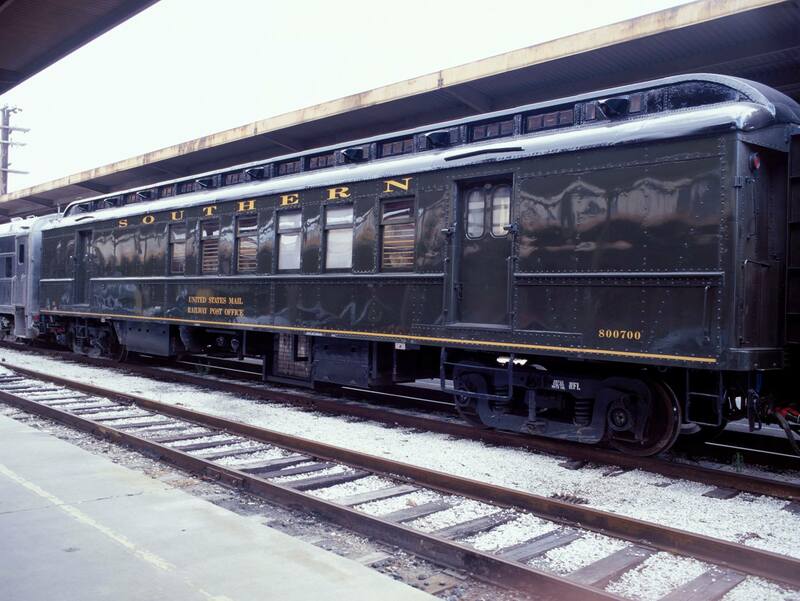 Kalamazoo Trains was another of the early manufacturers. Like Delton their scale was approximately 1:24. When they went out of business, their tooling was acquired by Delton. LGB (Lehmann Gross Bahn - the "Lehmann Big Railway" in German) was the original large scale manufacturer. They have indicated that the scale of their equipment is 1:22.5 which represents European narrow/meter gauge. LGB has stated that when they build equipment they want it to run on the smallest curve that they make (R1 ~ 24”) and that it must have the proper “look”. What this means is that LGB equipment is close to scale but they are NOT trying for true scale. LGB primarily makes European prototype equipment but has made some successful American style equipment albeit not necessarily to a specific prototype. It should be noted that LGB started with their manufacturing in Germany but eventually moved production to China. They are in the process of moving their manufacturing back to Germany / Eastern Europe. LGB had a proprietary DCC equivalent system (DCS) built into some of their later locomotives. DCS did not conform to the full set of DCC standards. The most recent LGB models are coming DCC ready. Marklin is another manufacturer that started early although they are perhaps best known for smaller gauges including Z. They did manufacture some “Gauge 1” equipment (1:32) but this was primarily of European prototype. When LGB went through their first bankruptcy, Marklin purchased the LGB lines and continued the LGB lines. Marklin itself went through a bankruptcy several years after the initial LGB bankruptcy. The Marklin lines including LGB were then purchased by a private German toy manufacturer. That company is continuing both the LGB and Marklin lines albeit with smaller selections of equipment. To date the new company has issued very few American prototype equipment. MDC was another of the early manufacturers. They indicated that their equipment was approximately 1:24 scale. They had a limited selection of freight cars with not a lot of detail. I believe they also had several models of diesel locomotives. I believe they went out of business. MTH (Mike’s Train House) is a manufacturer of 1:32 scale equipment. They use a proprietary DCC like system also called DCS. The MTH equipment will operate on regular DC current but the user-controlled features will not be available. To make the user-controlled features available, an AC power supply is required. MTH manufactures in other scales and is probably best known for its O-gauge (Lionel) equipment. Piko is a German manufacturer which is relatively new to the large scale train market. It should be noted that they have been manufacturing buildings and building kits for large scale for years and have been manufacturing smaller scale trains also. They do not indicate what scale their equipment is although it appears to be similar in size and profile to LGB. They appear to follow European prototypes primarily but do have a fair number of US prototype equipment. It appears that like LGB they do take liberties with proportions to make it look good. It appears that the Piko equipment is moderately priced and a large number of the engines come with sound. If the engines sound as good as the sample sounds on the Piko website this may be a benefit. I have worked with some Piko equipment and it is reasonably reliable. If service is required, repair parts are available in the US and their turnaround time is good. Many repairs can be accomplished but the end user. Polk’s Next Generation (PNG) is the successor to Aristocraft. When Aristocraft went out of business, the son of the Aristocraft president created PNG. To date PNG has issued only items which were previously manufactured for Aristocraft but not shipped from China. Presumably the scale is 1:29. PNG is now out of business. REA was another of the early manufacturers. They did indicate that their scale was 1:24, however when they went out of business their lines were acquired by Aristocraft and continued to be made. I am unaware if Aristocraft made any adjustments to the size of the equipment to match their (Aristocraft) 1:29 scale. Ro Trains / USA Trains came into existence about the same time as Aristocraft. Like Aristocraft, they were an answer to modelers wanting American prototype trains in addition to the few being offered by LGB. USA Trains has 3 major lines. The “American series” is 1:24 and is manufactured entirely in the US. The American series only has American prototype freight cars which have a fair amount of user applied detail parts. The “Ultimate series” is 1:29 and is manufactured in China and the US. 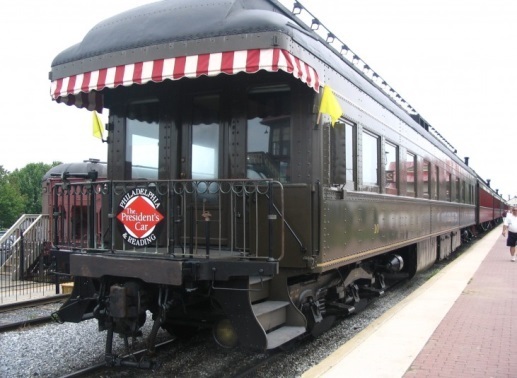 This series has not only American prototype freight cars, but also streamlined passenger cars and diesel engines. All of the Ultimate series come with metal wheels and have a large amount of detail. The third series is the “Prestige series” and like the Ultimate series is 1:29. The Prestige series consists of die cast locomotives (3 steam and a GG1 electric). All are highly detailed and expensive. All 3 lines hold up well under heavy running and most repairs can be handled by the end user. USAT locomotives are NOT DCC ready. Some “surgery” will be required to put in the DCC receiver. For users just wanting RC, there is a manufacturer of replacement motherboards which are a fairly simple swap out. 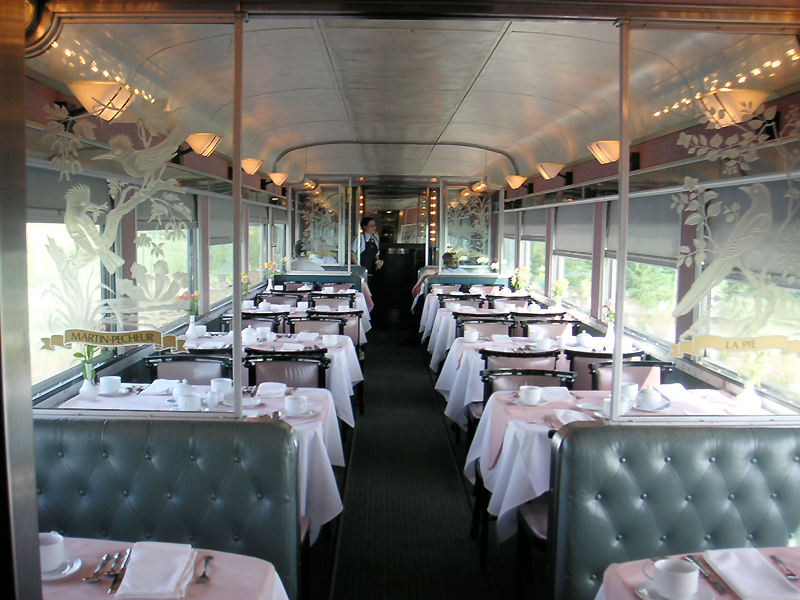 I began this interesting twist on the dining car while watching a favorite Smithsonian Channel show called Aerial America, where they were covering great small towns in America. They touched on some interesting tidbits regarding the history and founding of Sun Valley, Idaho. This first destination winter resort in the U.S. was developed by W. Averell Harriman, the son of railroad baron E. H. Harriman and at the time, Chairman of the Union Pacific Railroad. It was primarily developed to increase ridership on UP passenger trains in the West. The success of the 1932 Winter Olympics in Lake Placid, New York, spurred an increase in participation in winter sports, alpine skiing in particular. A lifelong skier, Harriman determined that America would embrace a destination mountain resort similar to those he enjoyed in the Swiss Alps. During the winter of 1935-36, Harriman enlisted the services of an Austrian count and ski expert Felix Schaffgotsch, to travel across the western U.S. to locate an ideal site for a winter resort, preferably near UP's rail network. Late in his trip and on the verge of abandoning his search for an ideal location for a mountain resort development, he backtracked toward the Ketchum area in central Idaho. Schaffgotsch was impressed by the mountains, adequate snowfall, abundant sunshine, moderate elevation, and absence of wind, and selected it as the site. Harriman visited several weeks later and agreed. A publicist was hired and named the resort "Sun Valley" and developed the slogan“Winter sports under a summer sun." The centerpiece of the new resort was the Sun Valley Lodge, which opened in December 1936. Harriman's connections to NY society people, FDR's administration, Hollywood stars, Olympic skiing hopefuls, and lots of media, guaranteed that the place would get attention. Not only did UP develop this premier ski area, but they also invented the world's first two snow ski chair lifts and debuted them at the opening of its Sun Valley, Idaho ski resort in December 1936. In Omaha, at Union Pacific Railroad's headquarters, members of the engineering department designed various ways to transport skiers up the slopes. Several mechanical engineers looked to adapt rope tows, J-bars and cable cars. Soon, prototypes of the chair lift were being built and tested at the locomotive and railcar repair shop complex in downtown Omaha. By the 1930s, railroads across the country were instrumental in transporting sports enthusiasts to the slopes aboard designated "ski trains”that usually included extra baggage space for stowing skis and other equipment. A writer later noted in Skiing magazine, “Skiing would probably not have expanded so rapidly during the 1930s and 1940s had there been no ski trains." One of the best-known ski trains was the "Snowball Special," begun in 1958 by the UP to carry passengers between Los Angeles and Sun Valley. Peel potatoes and boil whole for 10 minutes or until tender (overcooking will make shredding challenging). Shred potatoes and season with salt, pepper, onion puree and thyme. In an ovenproof pan, add shredded potatoes, bacon and green onions, sauté 5 minutes until golden brown. Flip, add whole cracked egg in the center, bake 3 minutes, add raclette cheese, finish baking 2 minutes. Garnish with parsley and enjoy. That's a wrap for our March Newsletter. 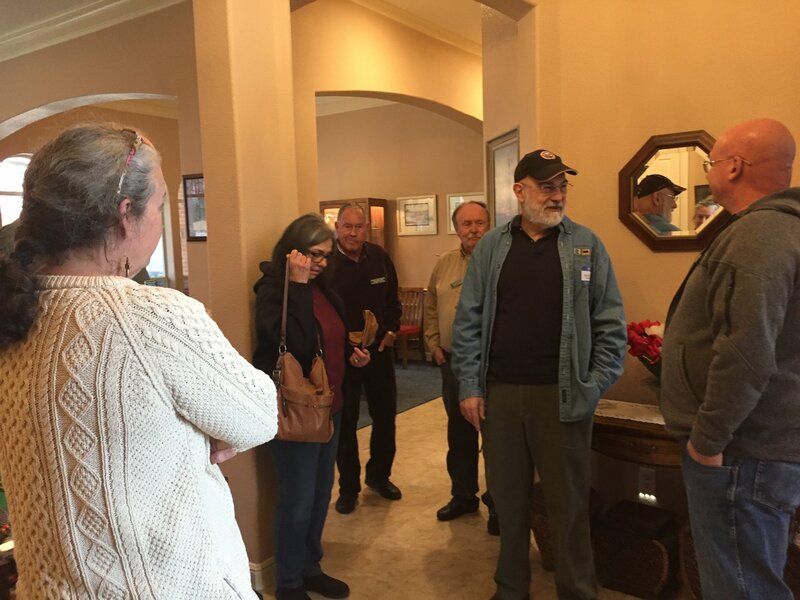 I hope to see many of our members at our next home meeting on Sunday, March 25th at 2:00 PM at Tom and M'Lou Lytle's: 2524 Willowdale Drive, Carrollton TX 75006. Thanks for reading. 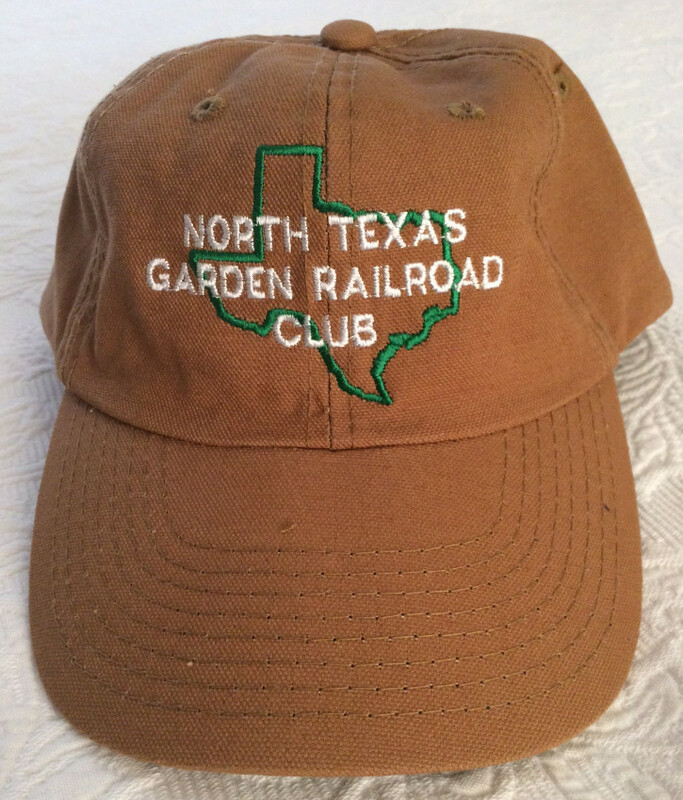 Copyright © 2018 North Texas Garden Railroad Club, All rights reserved.